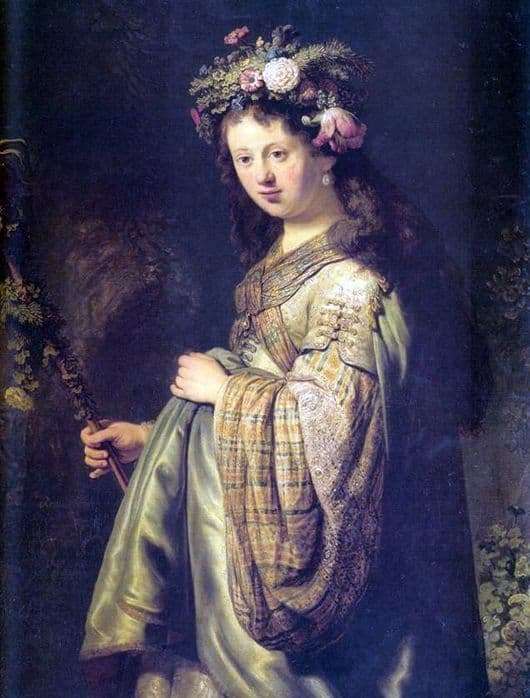 The great and talented artist Rembrandt van Rijn wrote a myriad of unique works of art, which to this day admire artists, art historians and true connoisseurs of painting. “Saskia Flora” is considered one of the most mysterious, charming and romantic nature of the artist. It was painted in oil on canvas in 1634. Here you can clearly see the pen and the individuality of the creator, which can be distinguished from other equally talented personalities. This is a portrait of his lady of the heart, whom he married in the same year. Saskia is presented in all its charms: youth, flowering, innocence, romance and lightness of nature. To convey such feelings and state of mind is difficult and painstaking. The rich clothing of the time is shown in full accordance with the era, flowers, which adorn the head add festivity and solemnity to the image. Sunlight complements the entire range of colors, allowing them to sparkle in new and unexpected variations. There is nothing to turn away from the perception of the image, on the contrary, I want to look, look and look. In our time it is hardly possible to meet such a pure and innocent creation, the thoughts that are open to our eyes at a glance. His beloved wife brought a ray of light into the ordinary and boring life of Rembrandt, which sharply turned his mood and state of mind. She is the muse that inspired him to masterpieces of pictorial art, which became a grand discovery for the whole world. He loved to dress his wife in velvet, brocade, pearls and shouted to the environment and the world what kind of gift he was given by fate. The author has portrayed Saskia many times, but this picture surpasses all his creations put together. The painting is located in the State Hermitage Museum in St. Petersburg, anyone can enjoy the creation of the great master with a capital letter of the word.